Palin conceded many people are still confused about why she made the decision to leave office. “You know why they’re confused? 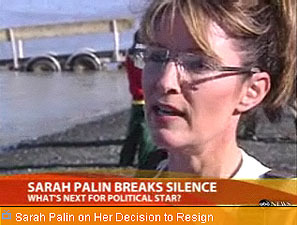 I guess they cannot take something nowadays at face value,” Palin said. I’m actually more willing than most to take Palin’s explanation at face value. The constant stream of piddling and frivolous ethics charges probably did get hard to put up with and probably did cost her a lot of money. But don’t most politicians in similar circumstances set up a legal defense fund of some kind? The attacks would still be annoying, but dealing with them doesn’t necessarily have to be either a huge time sink or a huge personal cost, especially when you have the fundraising power she does. Very mysterious. But my guess is that the other half of her explanation should be taken at face value too. (Well, face value plus a little bit extra.) Namely that she doesn’t want to be a lame duck. Not because she doesn’t want to milk the good citizens of Alaska for lots of overseas junkets, but because the entire legislature hates her guts these days and the whole thing has become a slog. “We won’t get anything done,” she told Snow, and just that’s no fun. Giving speeches to adoring throngs is way more satisfying.